iProperty Cloud comes with an array of functionality and features which can have a transformational effect for every estate agent, property maintenance and housing officer. The solution is designed to be user-friendly with a high user adoption rates through simplicity and automation. A modern and responsive interface accessible from any browser, within Microsoft Outlook or using native mobile and tablet apps. Single integrated estate ageny software and social housing solution including a complete CRM platform built on Microsoft Enterprise Business solutions platform: Microsoft Dynamcis 365 CRM and Microsoft’s Azure Cloud. Features include full CRM functionality, Sales, Lettings, Property Maintenance, Field Services, Customer Portal, a Public Website, Mobile Apps, Microsoft Outlook App – all in a single integrated solution, for a single monthly cost. Displaying all photos added as attachments to Notes on any Entity Form. Gallery can be embedded in Dynamics 365 Mobile Apps, Tablet Apps, Business Apps (Web Client and V9 Unified Interface). Photo Editor to Crop and Resize photos before or after upload. Photo Gallery only reads and displays photo attachments, ignoring other file types. Property Portals Integration: Rightmove, Zoopla, On the Market, Prime Location, etc. iProperty Cloud comes with full integration with many Property Portals. iProperty Cloud is built on Microsoft Dynamics 365 integration with Rightmove, Zoopla, On the Market and Prime location. Our integration design takes advantage of the latest real-time feed API integration with Rightmove, Zoopla and On the Market. Using a combination of native Dynamics 365 plugins, workflows and custom actions, we are able to instantly create, update and delete property listings from Dynamics 365 directly to Rightmove, Zoopla or On the Market. Additionally, we have scheduled workflow processes to regularly retrieve property leads and phone call enquiries about your properties from Property portals such as Rightmove to Microsoft Dynamics 365. Workflow intervals are adjustable to your exact requirements, from 15 minutes (minimum time allowed by Rightmove) to any other length of time as required. 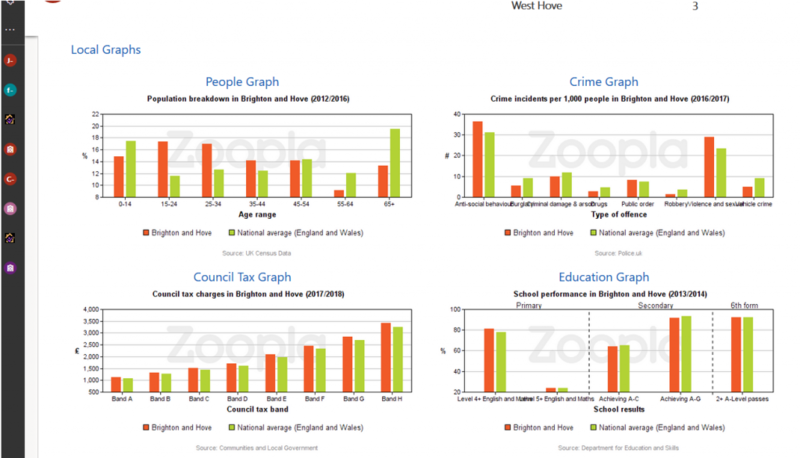 iProperty Cloud also comes at no extra cost with local graphs for the property area based on its postcode, including population age range, Crime, Education and Council Tax breakdowns. Additional information is available upon request. Matching properties to an applicant’s exact requirements, with the ability to generate a property listing of all matching requirements. 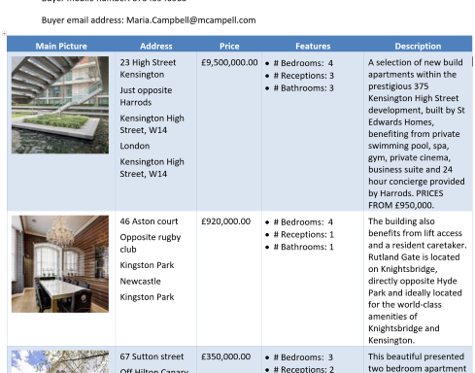 This Property Listing report can be customised by your own staff and the system users without any need for development or the need to contact us, as it is all built in Microsoft Word engine (part of iProperty Cloud Microsoft Dynamics and Office integration). Your users can also add marketing and contact information as desired (using just a Word Template!). The matching engine also comes with the ability to match suitable applicants to each property so that you can run your marketing campaign instantly, as soon as a property is published, to be available on the market. Applicants preferences that match your new property, can be added as successful matches via the single click of a button! Contact us to see how easy it is to match properties and applicants. In addition to our local information and maps, iProperty Cloud has built-in market intelligence at no extra cost. Our Market intelligence module includes average sold house prices in this area, house sales turnover, number of sales and Zed-Index. More market intelligence is available upon request. View Property Sale progress (Buyers and Vendors) including current status, agency updates and negotiator notes on current stage within the sale. This directly reduces the number of calls to your office / call centre. Property Maintenance issues including current issues, contractors assigned to fix issues, upcoming and past appointments for property maintenance activities. A User-Friendly Customer Portal ensures full ability for your Customers: Vendors, Landlords, Tenants and/or Buyers to view their accounts and property status using their mobile phones (iPhone, Android) and Tablets (iPad, Android and Windows). iProperty Cloud comes with a complete Public website that allows estate agents and social housing providers such as Housing associations and local councils to advertise their properties for Sale or To Let. The Public Website is fully integrated with the iProperty Cloud Solution which allows your users to publish a property to your public website (or remove it) via the single click of a button. Full Search Engine Optimisation (SEO) Capabilities for easier indexing by search engines such as Google and Bing. Content Management System (CMS) allowing for the editing of your marketing and advertising information and media. One-Click-Publish feature allows your Property information to be published to your website with a single click, pushing all property details including property photos, floor plans, brochure, EPC, 360 videos – all onto your live public website. iProperty Cloud solution is accessible with any web browser: Internet Explorer, Microsoft Edge, Google Chrome, Mozilla Firefox, etc. Not only that, iProperty Cloud solution can also be fully accessed from within your Microsoft Outlook Email, giving your users to access the whole solution from within their email client. This allows all your staff to track emails within iProperty Cloud to ensure service continuity and improved customer service. iProperty Cloud also comes with complete set of native iPhone, iPad, Windows and Android apps allowsing all your staff to access the full solution on their mobile phones, tablets and Windows Apps. This Mobility and Outlook access to the full solution capability allows Sales and Lettings negotiators, Field and housing officers, valuators and viewings professionals to access the full suite of functionality of iProperty Cloud Solution in the office, on the go, on site and practically anywhere on earth with internet access! (offline capabilities also available). Our Speech 2 Text solution provides your staff with the ability to dictate property visit reports, property valuations, property viewings feedback, maintenance jobs feedback and more. Rather than having to spend hours manually writing up reports, your staff can swiftly dictate them, and then conveniently edit and submit as desired. Our innovative voice dictation service takes advantage of world-class proprietary Microsoft Azure APIs. iProperty Cloud also features an intelligent Chat Bot which works for your business 24/7, allowing your prospects to enquire about properties, viewings availability and book next day appointments with your available agents 24/7, even while your business is closed! iProperty Chat Bot also provides automated updates and feedback to your Buyers, Vendors, Tenants and Landlords, without you or any of your team ever having to pick up the phone. iProperty Cloud has been built, from the ground up, with the objective of maximising efficiency savings for estate agents. The platform features automation capable of delivering up to a 20% time saving for your team. Examples of automation delivering efficiency include the ability to setup a property and upload its photos on-the-go using an iPad, an Android Tablet, or any of our solution tablet apps. Your staff only need to create a property record once, and it will be pushed to your public website as well as your customers’ self-service portal, without any additional data entry effort required. Other massive time and effort savings are delivered through the self-service capability of the solution. The self-serve portal allows all of your Customers: Landlords, Vendors, Buyers and Tenants to access the latest updates on their property on-demand, saving your agency time and effort spent on calls with customers requesting updates. We estimate that these savings would make your business 20% more time-efficient. In real terms, this is equivalent to freeing up several full-time staff members to focus on growing your revenue, rather than time-consuming data entry, customer enquiries and customer follow-ups on current systems. With the savings and efficiencies delivered through the iProperty Cloud platform, we forecast a 100% ROI within the first 24 months of switching to iProperty Cloud. This is in addition to the instant savings delivered by the system.